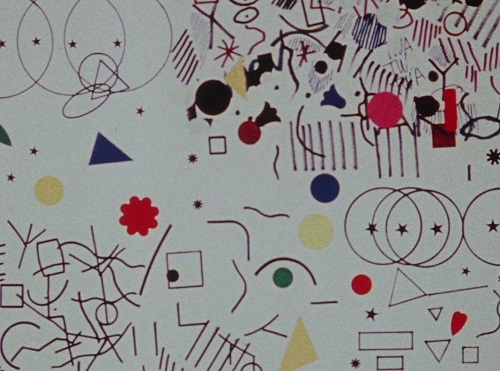 Polka Graph, 1947, color, sound, originally 35mm. Began as an actual chart of Shostakovich's Polka from "The Age of Gold. "Award winner at Venice Film Festival. 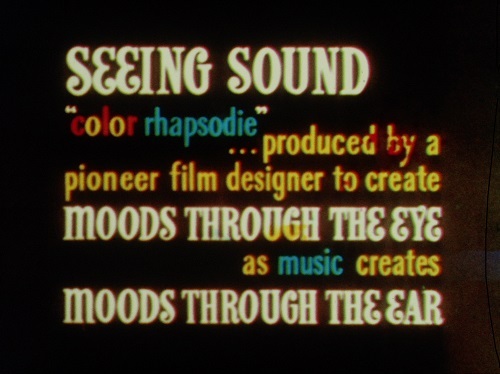 Color Rhapsodie (1948), color, sound, originally 35mm. Music: Liszt's "Hungarian Rhapsody No. 2." 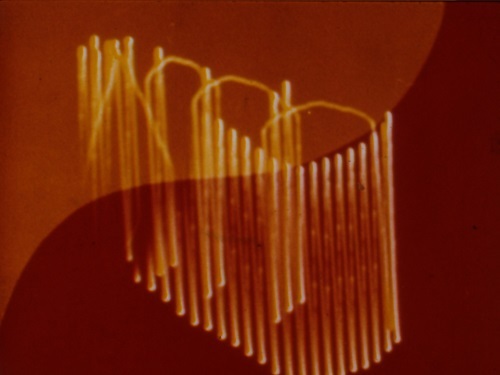 Abstronic (1952), color, sound, originally 35mm. These electronic pictures of the music are a natural phenomena which take place in the sub-atomic world; they are then captured on the Cathode Ray Oscilloscope and filmed with the motion picture camera. The colored backgrounds are hand done and superimposed on the electronic animation of the musical themes. 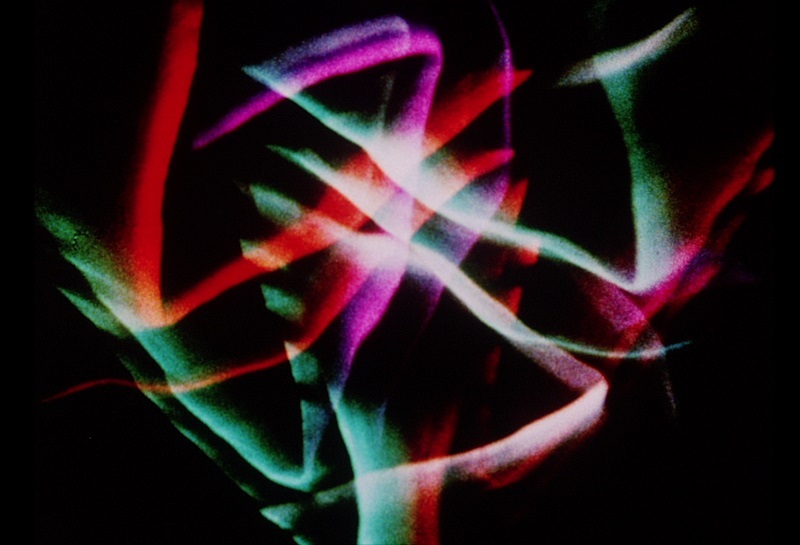 In this movie, film artist Mary Ellen Bute combines Science an Art to create "Seeing Sound." (Press release from Ted Nemeth Studios). Mandala, 1953, color, sound, Balinese gamelan music. Originally 16mm. Belson painted imagery on long scrolls, which he then filmed. Using long paper scrolls, he could paint fluidly down the length of the scroll, then film the imagery frame by frame afterwards. 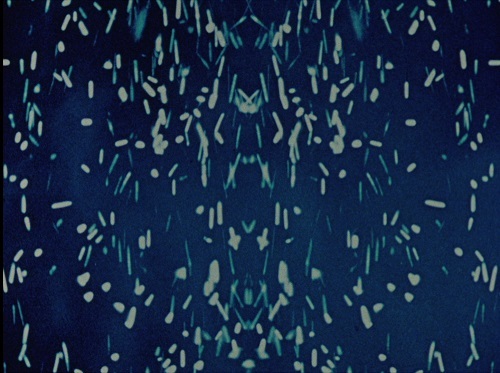 Mandala is his first film to use mandala imagery, and an early expression of his interest in eastern philosophies (CVM). Meditation is “a poetic, abstracted account of the meditational experience, inspired – according to Belson – by the words of three spiritual masters: Yogananda, Ramakrishna and Sri Ramana Maharshi…” (1972 Pyramid Films notes). 1952 Mobilcolor Performance at the Guggenheim, 1952, color, silent. Originally 16mm. Photo above, label on can containing original 16mm Kodachrome print, Dockum collection at CVM. This performance, a demo by Dockum for curator Hilla Rebay, was shot at the Guggenheim, NY by cinematographer Ted Nemeth (partner of Mary Ellen Bute). Preserved by CVM for the 2005 "Visual Music" exhibition at MOCA LA and Hirshhorn Museum, Washington D.C.
Sonata for Pen, Brush and Ruler, 1968, color, hand-drawn sound by Spinello. Made by handpainting sound and picture onto clear 16mm leader. 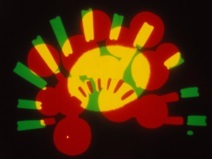 Mobiles, 1978, color, sound, originally 16mm. 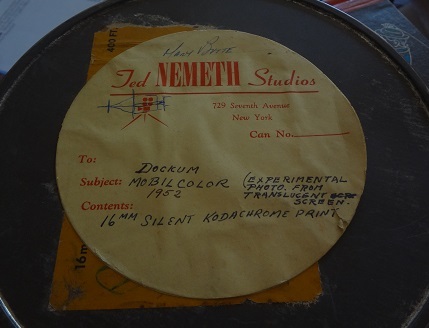 Preserved by CVM (with NOMI Group) with support from the National Film Preservation Foundation. Abstract animation drawn and painted on paper.